We are always looking for new and enjoyable ways to raise funds to help keep the bureau at the heart of your community. We have applied for a number of places on Nightrider 2013 and hope those of you who love cycling will register for this 100km (approx 62miles) challenge. While the capital sleeps over £1million will be raised for good causes. Nightrider™ appeals to people of all ages and all over the UK. Participants last year came from all corners of the UK as well as France. It is not just for London based people. Generally speaking, we know from the data from the 2011 event that the typical cyclist on Nightrider™ was a man in his thirties. Many people sign up with a friend or relative. 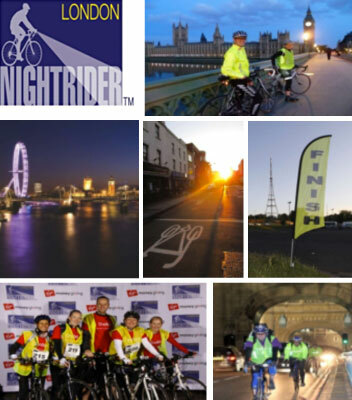 We are waiting for further notification from the Nightrider team about the registration process for 2013 and will keep you posted, plenty of time to start your training regime! If however, you have already registered but have not decided on which charity to support, the very fact that you are reading this may be as good a place to start as any, just give us a call to discuss how you can support Citizens Advice Bournemouth!